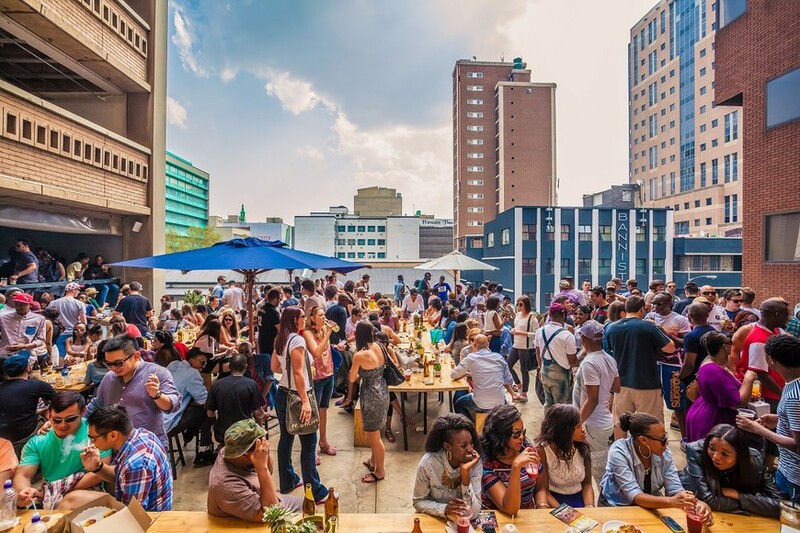 One of Joburg's most youthful neighbourhoods, Braamfontein is the city's student heartland, home to the University of Witswatersrand as well as 20 independent colleges. Whether you live in Braamfontein or simply come through to visit campus, if you're a student you're sure to be spending a lot of time here. Here's our guide to getting the most out of Braamfontein on a student's budget and becoming a real 'Braamie'. In Braamfontein, takeaways are elevated to an art form and you can easily score lunch for under R50. 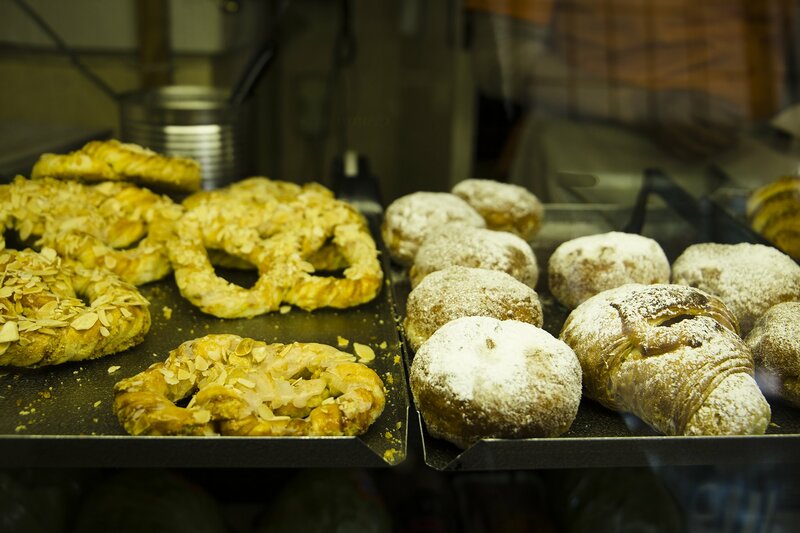 Start out the morning with freshly baked authentic German treats from Black Forest Bakery. One of the oldest bakeries in town, the indomitable Maisie has been working the counter for more than 35 years. It's easy to miss the entrance to this tiny spot, unless you happen to be passing by early in the morning of course when the queue stretches out into the street and delivery vans come and go. The sweet treats like the jam doughnuts and sweet pretzels are perfect comfort food and an ideal snack if you're on-the-go. For a more relaxed breakfast (with the added bonus of free wifi) Galata Bakery and Coffee on the colourful Grove square offers a great value Turkish breakfast which includes menemen (Turkish-style scrambled eggs) and gozleme (traditional flatbread) with cheese, tomatoes, olives and honey on the side plus traditional Turkish tea. For a lunch option that is both on and off campus, head to WAM Café inside the Wits Art Museum and take a seat by the expansive windows for a chance to people watch. The cafeteria-style cafe is aimed squarely at a student budget and you can get lunch for under R40. 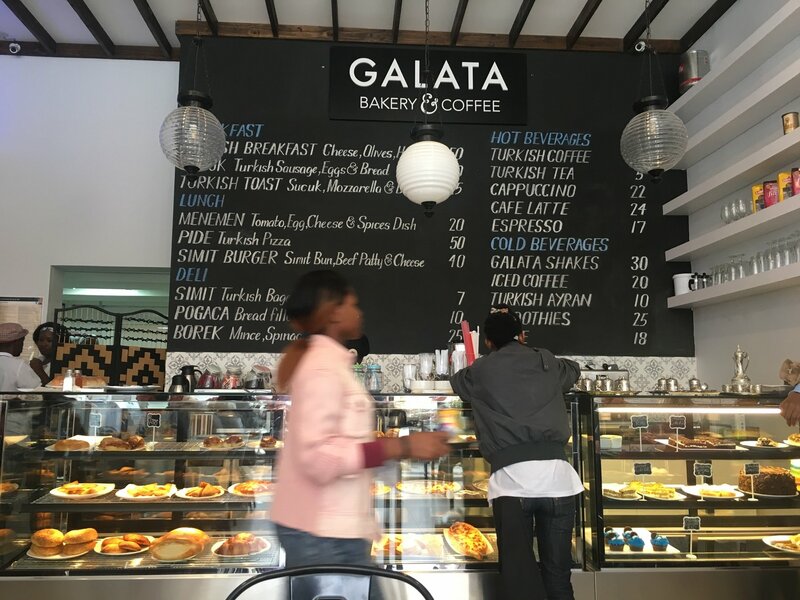 Around the corner at 27 De Beer Street, Kota Paleis brings the kasi to Braamfontein, serving up classic kotas with all the traditional trimmings like Russians, cheese and plenty of spicy atchar. For under R30 you can fill up for the best part of the day and you'll likely spot many of your classmates in the queue. A few blocks away at 87 De Korte Street, there's also Braamfontein stalwarts R Janas for filling curries and rice. This family-run Indian takeaway sells the full range of local Durban-style takeaway lunch favourites such as samoosas (R5 each), breyanis, roti rolls and, of course, the classic South African bunny chow. If you fancy a healthier lunch, splash out on delicious fresh salads and delicious home-cooked food at Love Food’s harvest table, where you pay by weight. 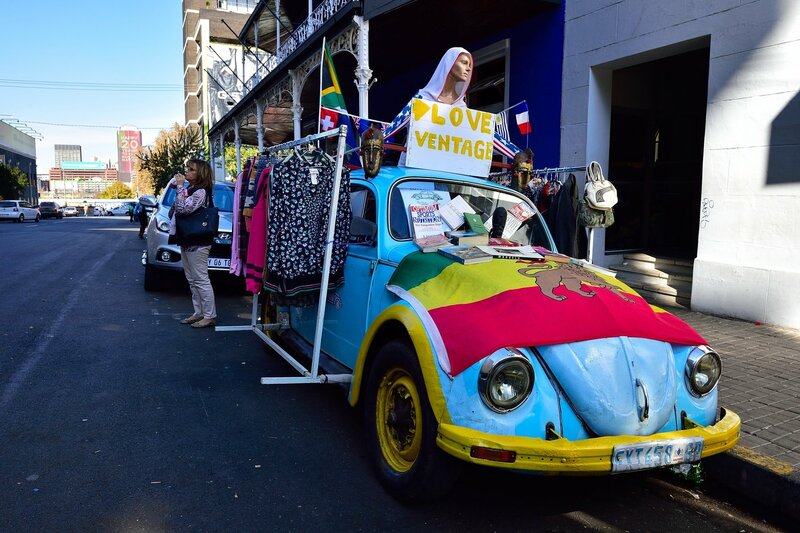 A quick walk through Braamfontein reveals a well-known secret; Braamfontein is vintage mad. With plenty of vintage vendors who have a great eye for the latest trends, getting the look doesn’t have to break the bank. Check out the cheekily-named TV (Thrift Vintage) Shop across the street from WAM Café for bargain 1950s, 1960s and 1990s clothing. You might need to dig deep through the rails, but it's worth the hunt for interesting second-hand threads that will cost you from just R5 to R50 an item. Alternatively spend a leisurely Saturday shopping on De Beer Street. Start by taking a look around the pop-up vintage market that happens every Saturday morning in and around the Kitchener's Carvery Bar where you can shop for everything from tie-dye shirts to quirky shades and then head up to the top level of the Neighbourgoods Market for boutique vintage brands and thrift steals. After the bustling rooftop Neighbourgoods Market on Saturday afternoons, as vendors and market-goers spill out onto the street and the sun sets, the corner of Juta and De Beer Streets transforms into Braamfontein’s nightlife hub, attracting the young-at-heart from the northern suburbs as well as local students. Start your pub crawl at Kitchener's (where cover charges usually apply after 20:00), and jam along to DJ sets of timeless underground hits. If you’re in the mood for a late night, head to Great Dane and show off your best dance moves with some of the hottest retro and radio hits on the lineup. Other major hotspots include the Republic of 94, whose huge beer garden is often used for DJ parties or enjoy a more relaxed evening of pizza and drinks on the Grove piazza at 86 Public. Make sure to also save the date for First Thursdays on the first Thursday of every month. 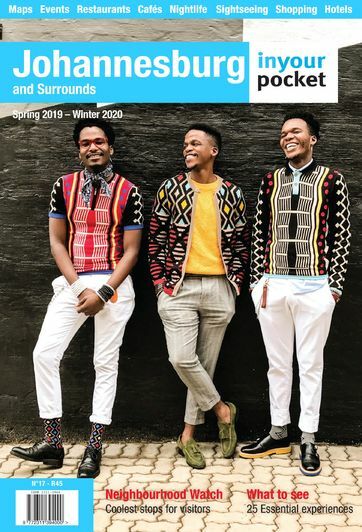 This free art-centric event sees Braamfontein's galleries opening late with DJs, live music and art performances a regular feature at many of the participating venues. 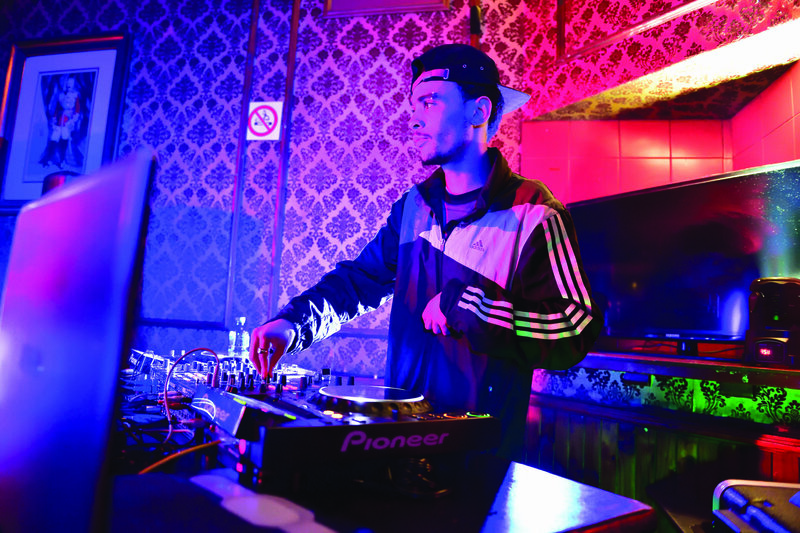 A particularly popular First Thursdays party is Puma Select's social club with DJs performing in the concept store's rear courtyard. Puma Select's parties are free to enter, though you must first register online to get access. Also keep your eye on The J&B Hive. A business incubator for young entrepreneurs, every year The Hive provides space for a choice collection of budding local entrepreneurs, providing them with the basic essential connectivity that young start-ups require. The collab space also hosts regular events that are open to the publuc including talks and discussions as well as gigs and DJ parties. While the City Sightseeing Bus remains a great way to get a quick overview of Joburg for the newbie, for many students it's still quite a pricey deal. A self-guided budget alternative can be to ride the circular C-4 Rea Vaya bus through town from Park Station, getting off at Library Gardens to explore the heart of Joburg's historic mining district and at the Johannesburg Art Gallery for one of the best collections of African art in the city. For a great introduction to Braamfontein’s history, public art and hidden gems, join Jozy Triangel’s Blue B walking tour of the neighbourhood, where you'll get a unique insight into Braamfontein's many hidden treasures, including the coolest new graffiti murals. If art is your thing, then you are spoilt for choice. Braamfontein is home to an excellent selection of art galleries and all of them are free. Start your art exploration at the Wits Art Museum. Home to an amazing collection of over 12,000 African historical and contemporary artworks, only a fraction of the museum collection is ever on display at any one time. In conjunction with its regular exhibition programme, Wits Art Museum (or WAM as it is known for short) also hosts free walkabouts and drawing classes on Saturdays. For edgy and thought-provoking contemporary art by some of South Africa’s most daring and occasionally controversial art luminaries, head to Kalashnikovv Gallery on Juta Street and to Stevenson gallery next door. At Braamfontein's major museums, Origins Centre on the Wits campus and Constitution Hill, students get discounted entry prices if they show their student cards. If you are really saving money then remember you can also walk explore the Constitutional Court and the Old Fort ramparts at Constitution Hill for free.